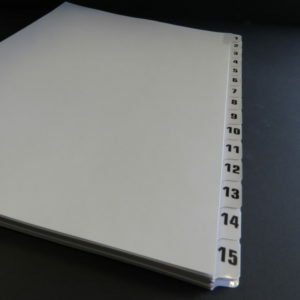 Buy A5 Numbered Tab Dividers from as little as just £43.20 per pack at OM Binding Supplies. Next day delivery available on orders made before 12 PM. Our printed A5 numbered tab dividers come in all sizes up to 1-500, A-Z and Jan-Dec. Buy online or by telephone. 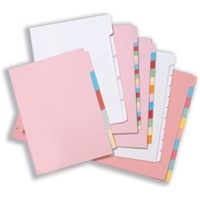 Buy A4 Numbered Tab Dividers from as little as just £43.20 per pack at OM Binding Supplies. Next day delivery available on orders made before 12 PM. Our printed A4 numbered tab dividers come in all sizes up to 1-500, A-Z and Jan-Dec. Buy online or by telephone. Our selection of A5 plain tab dividers are fully reversed or collated in A5 13mm tab sizes and are of exceptional value. 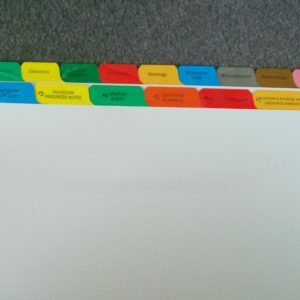 Our A5plain tab dividers are available from just £43.20 per set and can be delivered the next working day on all orders made before 12 pm. Our selection of A4 plain tab dividers are fully reversed or collated in A4 13mm tab sizes and are of exceptional value. Our A4plain tab dividers are available from just £19.20 per set and can be delivered the next working day on all orders made before 12 pm. A4 13mm tab produced on 200gsm high quality digital card. 13mm Tab is reinforced with toner-receptive mylar plastic. Supplied unpunched for your preferred binding method. Can be supplied forward or reverse collated.